A crucial problem in news media coverage of the Syrian civil war has been how to characterize the relationship between the so-called “moderate” opposition forces armed by the CIA, on one hand, and the Al Qaeda franchise Al Nusra Front (and its close ally Ahrar al Sham), on the other. But it is a politically sensitive issue for US policy, which seeks to overthrow Syria’s government without seeming to make common cause with the movement responsible for 9/11, and the system of news production has worked effectively to prevent the news media from reporting it fully and accurately. The Obama administration has long portrayed the opposition groups it has been arming with anti-tank weapons as independent of Nusra Front. In reality, the administration has been relying on the close cooperation of these “moderate” groups with Nusra Front to put pressure on the Syrian government. The United States and its allies–especially Saudi Arabia and Turkey–want the civil war to end with the dissolution of the government of Syrian President Bashar al-Assad, who is backed by US rivals like Russia and Iran. Reflecting the fact that Nusra Front was created by Al Qaeda and has confirmed its loyalty to it, the administration designated Nusra as a terrorist organization in 2013. But the US has carried out very few airstrikes against it since then, in contrast to the other offspring of Al Qaeda, the Islamic State or ISIS (Daesh), which has been the subject of intense air attacks from the US and its European allies. The US has remained silent about Nusra Front’s leading role in the military effort against Assad, concealing the fact that Nusra’s success in northwest Syria has been a key element in Secretary of State John Kerry’s diplomatic strategy for Syria. When Russian intervention in support of the Syrian government began last September, targeting not only ISIS but also the Nusra Front and US-supported groups allied with them against the Assad regime, the Obama administration immediately argued that Russian airstrikes were targeting “moderate” groups rather than ISIS, and insisted that those strikes had to stop. are doing so under the leadership of an Al Qaeda affiliate. The willingness of the news media to go beyond the official line and report the truth on the ground in Syria was thus put to the test. It had been well-documented that those “moderate” groups had been thoroughly integrated into the military campaigns directed by Nusra Front and Ahrar al Sham in the main battlefront of the war in northwestern Syria’s Idlib and Aleppo provinces. For example, a dispatch from Aleppo last May in Al Araby Al-Jadeed (The New Arab), a daily newspaper financed by the Qatari royal family, revealed that every one of at least ten “moderate” factions in the province supported by the CIA had joined the Nusra-run province command Fateh Halab (Conquest of Aleppo). Formally the command was run by Ahrar al Sham, and Nusra Front was excluded from it. But as Al Araby’s reporter explained, that exclusion “means that the operation has a better chance of receiving regional and international support.” That was an indirect way of saying that Nusra’s supposed exclusion was a device aimed at facilitating the Obama administration’s approval of sending more TOW missiles to the “moderates” in the province, because the White House could not support groups working directly with a terrorist organization. A further implication was that Nusra Front was allowing “moderate” groups to obtain those weapons from the United States and its Saudi and Turkish allies, because those groups were viewed as too weak to operate independently of the Salafist-jihadist forces—and because some of those arms would be shared with Nusra Front and Ahrar. 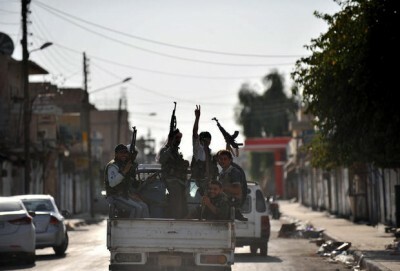 After Nusra Front was formally identified as a terrorist organization for the purposes of a Syrian ceasefire and negotiations, it virtually went underground in areas close to the Turkish border. A journalist who lives in northern Aleppo province told Al Monitor that Nusra Front had stopped flying its own flag and was concealing its troops under those of Ahrar al Sham, which had been accepted by the United States as a participant in the talks. That maneuver was aimed at supporting the argument that “moderate” groups and not Al Qaeda were being targeted by Russian airstrikes. 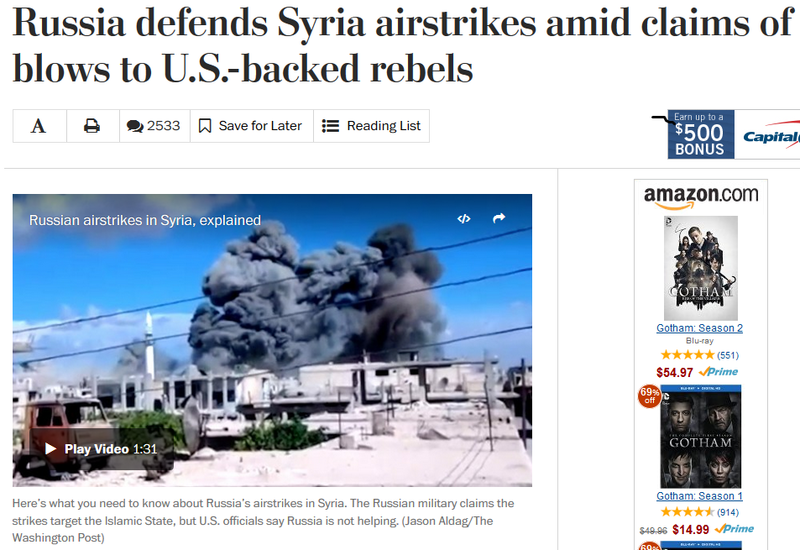 But a review of the coverage of the targeting of Russian airstrikes and the role of U.S.-supported armed groups in the war during the first few weeks in the three most influential US newspapers with the most resources for reporting accurately on the issue—the New York Times, Washington Post and Wall Street Journal–reveals a pattern of stories that tilted strongly in the direction desired by the Obama administration, either ignoring the subordination of the “moderate” groups to Nusra Front entirely or giving it only the slightest mention. In an October 1 article,Washington Post Beirut correspondent Liz Sly wrote that the Russian airstrikes were being “conducted against one of the few areas in the country where moderate rebels still have a foothold and from which the Islamic State was ejected more than a year and a half ago.” To her credit, Sly did report, “Some of the towns struck are strongholds of recently formed coalition Jaish al Fateh,” which she said included Nusra Front and “an assortment of Islamist and moderate factions.” What was missing, however, was the fact that Jaish al Fateh was not merely a “coalition” but a military command structure, meaning that a much tighter relationship existed between the US-supported “moderates” and the Al Qaeda franchise. Sly referred specifically to one strike that hit a training camp in the outskirts of a town in Idlib province belonging to Suquor al-Jabal, which had been armed by the CIA. But readers could not evaluate that statement without the crucial fact,reported in the regional press, that Suquor al-Jabal was one of the many CIA-supported organizations that had joined the Fateh Halab (“Conquest of Aleppo”), the military command center in Aleppo ostensibly run by Ahrar al Sham, Nusra Front’s closest ally, but in fact under firm Nusra control. The report thus conveyed the false impression that the CIA-supported rebel group was still independent of Nusra Front. 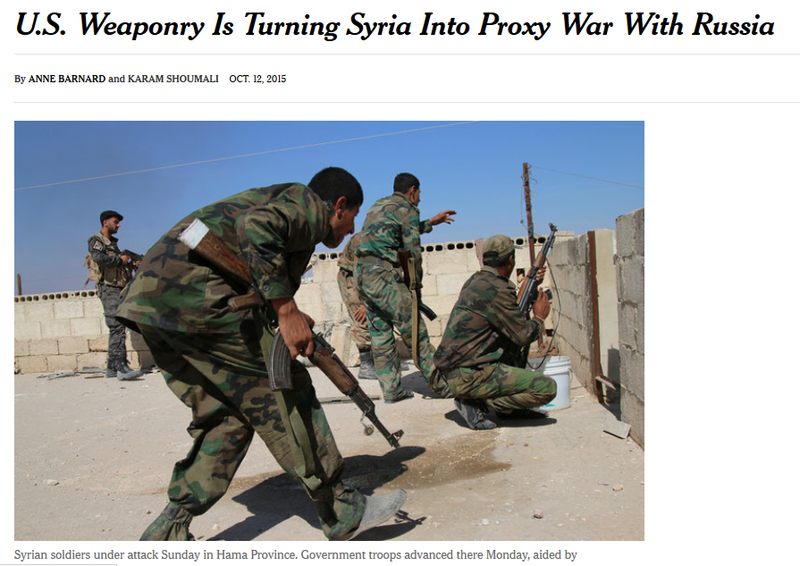 An article by New York Times Beirut correspondent Anne Barnard (co-authored by the Times stringer in Syria Karam Shoumali—10/13/15) appeared to veer off in the direction of treating the US-supported opposition groups as part of a new US/Russian proxy war, thus drawing attention away from the issue of whether the Obama administration support for “moderate” groups was actually contributing to the political-military power of Al Qaeda in Syria. 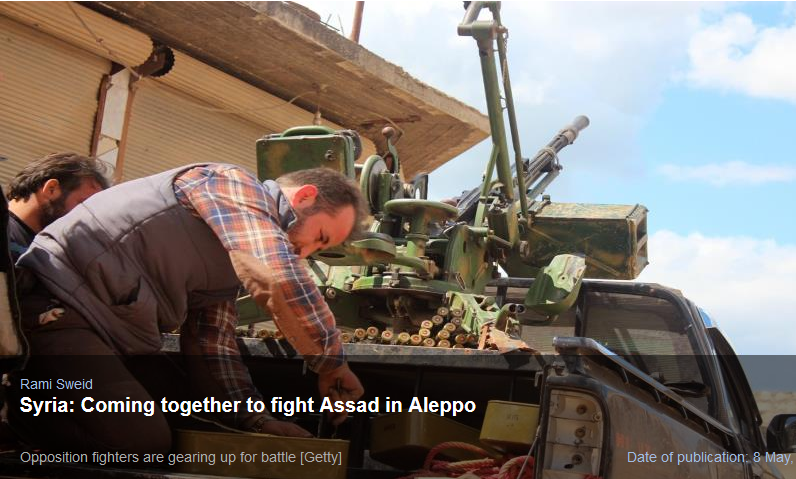 Under the headline “US Weaponry Is Turning Syria Into Proxy War With Russia,” it reported that armed opposition groups had just received large shipments of TOW anti-tank missiles that had to be approved by the United States. 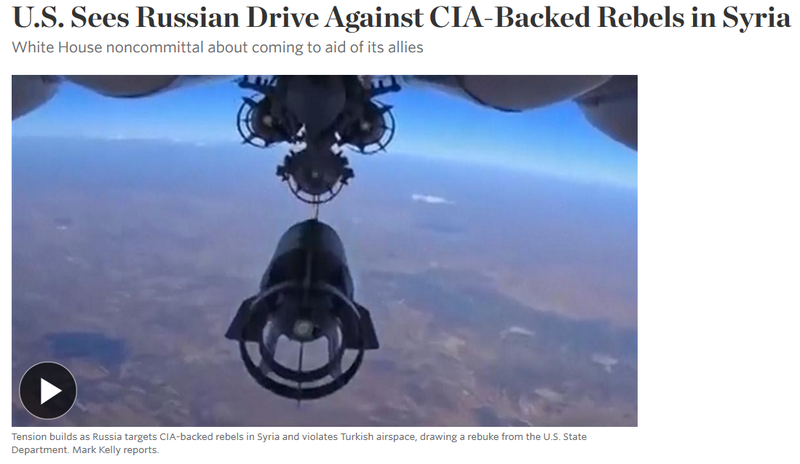 Quoting the confident statements of rebel commanders about the effectiveness of the missiles and the high morale of rebel troops, the story suggested that arming the “moderates” was a way for the United States to make them the primary force on one side of a war pitting the United States against Russia in Syria. While that would seem like a welcome development for United States policy makers, in practice it presented another quandary, given that the Nusra Front was among the groups benefiting from the enhanced firepower. Unfortunately, Barnard’s point that US-supported groups were deeply embedded in an Al Qaeda-controlled military structure was buried at the end of a long piece, and thus easily missed. The headline and lead ensured that, for the vast majority of readers, that point would be lost in the larger thrust of the article. The Wall Street Journal’s Adam Entous approached the problem from a different angle but with the same result. He wrote a story on October 5 reflecting what he said was anger on the part of US officials that the Russians were deliberately targeting opposition groups that the CIA had supported. Entous reported that US officials believed the Syrian government wanted those groups targeted because of their possession of TOW missiles, which had been the key factor in the opposition’s capture of Idlib earlier in the year. But nowhere in the article was the role of CIA-supported groups within military command structures dominated by Nusra Front even acknowledged. Still another angle on the problem was adopted in an October 12 article byJournal Beirut correspondent Raja Abdulrahim, who described the Russian air offensive as having spurred US-backed rebels and the Nusra Front to form a “more united front against the Assad regime and its Russian and Iranian allies.” Adbulrahim thus acknowledged the close military collaboration with Nusra Front, but blamed it all on the Russian offensive. And the story ignored the fact that those same opposition groups had already joined military command arrangements in Idlib and Aleppo earlier in 2015, in anticipation of victories across northeast Syria. The image in the media of the US-supported armed opposition as operating independently from Nusra Front, and as victims of Russian attacks, persisted into early 2016. But in February, the first cracks in that image appeared in theWashington Post and New York Times. It was the first time any major news outlet had reported that US-supported armed opposition and Nusra Front front troops were “intermingled” on the ground. And in the very next sentence DeYoung dropped what should have been a political bombshell: She reported that Kerry had proposed in the Munich negotiations to “leave Jabhat al Nusra off limits to bombing, as part of a ceasefire, at least temporarily, until the groups can be sorted out.” At the same time, Kerry was publicly demanding in a speech at the Munich conference that Russia halt its attacks on “legitimate opposition groups” as a condition for a ceasefire. Kerry’s negotiating position reflected the fact that CIA groups were certain to be hit in strikes on areas controlled by Nusra Front, as well as the reality that Al Qaeda-linked Nusra Front and Ahrar al Sham were central to the success of the US-backed military effort against Assad. We, the ISSG, have been very clear in saying that Al Nusra and Daesh [ISIS] are not part of any kind of cease-fire or any kind of negotiated cessation of hostilities. So if you hang out with the wrong folks, then you make that decision…. You choose who hang out with, and that sends a signal. Although I pointed out the significance of the statement (Truthout, 2/24/16), no major news outlet saw fit to report that remarkable acknowledgement by the State Department spokesperson. Nevertheless, the State Department had clearly alerted the Washington Post and the New York Times to the fact that the relationships between the CIA-supported groups and Nusra Front were much closer than it had ever admitted in the past. Kerry evidently calculated that the pretense that the “moderate” armed groups were independent of Al Nusra front would open him to a political attack from Republicans and the media if they were hit by Russian airstrikes. So it was no longer useful politically to try to obscure that reality from the media. In fact, the State Department now seemed interested in inducing as many of those armed groups as possible to separate themselves more clearly from the Nusra Front. The twists and turns in the three major newspapers’ coverage of the issue of relations between US-supported opposition groups and Al Qaeda’s franchise in Syria thus show how major news sources slighted or steered clear of the fact that US client armed groups were closely intertwined with a branch of Al Qaeda—until they were prompted by signals from US officials to revise their line and provide a more honest portrayal of Syria’s armed opposition. Gareth Porter, an independent investigative journalist and historian on US national security policy, is the winner of the 2012 Gellhorn Prize for Journalism. His latest book is Manufactured Crisis: The Untold Story of the Iran Nuclear Scare, published in 2014.